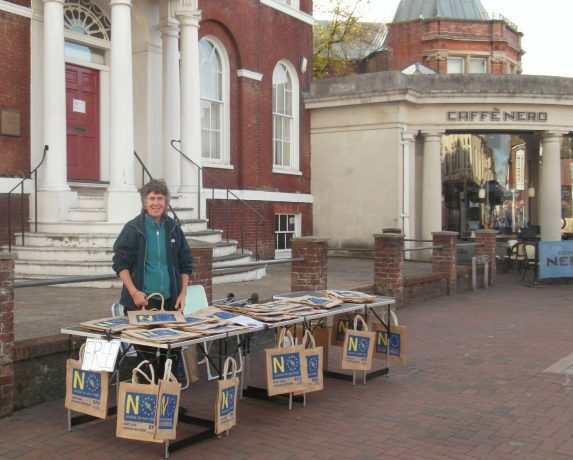 UKIP Branches from Mid-Dorset & Poole held successful EFDD and UKIP stalls at Poole High Street on Saturday, 3rd November. On the EFDD stall, we gave out free EFDD ‘Brexit’ shopping bags. These were very popular and greatly appreciated – many people were pleased to have something highly visible to express their support for ‘Leave’. We cleared two boxfulls within an hour. At one point about half the shoppers in the precinct were walking up and down with them ! Later on, we opened our UKIP stall. Most were pleased to see UKIP there and many people came up and asked some interesting questions. A lot of people were pleased just to find some people that they could talk to without being ‘judged’. Quite a few passers-by were keen to share their suggestions on what should be done with Theresa May and her Cabinet ‘deal’. By 12.30 pm we had almost emptied our supply of UKIP literature and booklets. Particularly popular were the free ‘Outpost’ newspapers. David Kurten’s pamphlet on ‘Cultural Marxism’ also attracted a lot of interest, especially from some of the younger people and those from Eastern European countries. Our thanks to all those who gave up their time to help and support us.